Cricket is bit of a marmite game for the British public. I love it, and would happily spend any free afternoon running around in my whites. My wife, however, feels like it is a waste of time and a way for me to get out of doing other things. Love it or hate it, cricket is a big part of the British summer, and even if you don’t like the sport, the thought of having a lazy picnic by the green while a bunch of men and women in white have a friendly throw about is rather charming and romantic. A big part of cricket is obviously chasing a red ball while it slowly runs away from you, and to be fair, it is one of the more frustrating parts of the game. However, running is vital to any summer sport, and running brings to you the need for comfortable footwear. A lot of effort normally goes into getting the right shoes, but not a lot of people focus on the socks. Interestingly, I recently came across the 1000 Mile Cricket Sock, which is actually work by the English Cricket Team. It is a heavy weight sock, featuring Wool Ultra, giving it superior wicking qualities, keeping your feet dry on those hot and humid days. Also included are specific padded comfort zones, a fitted heel, flat toe seams and arch bracing, all to give you a custom fit. All this, and yet it is 20% lighter than your average wool sock. The first thing when you put it on is the thick woolly feel. It gives your foot a great support, and that is evident straight away. The next thing you notice is the extra bounce and spring in your step thanks to these. As you put your shoes on, the comfort is enhanced as they give you a more specialized fit. Word of warning here though. 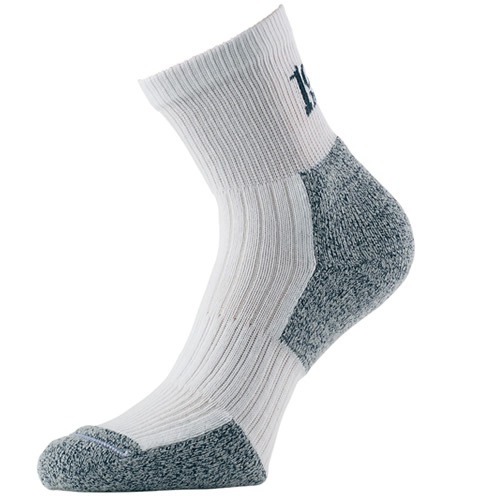 If you normally wear thin socks, and have shoes that are a tight fit, you’ll probably struggle with these socks thanks to their extra volume. The extra volume is worth it though. As far as the performance in the game goes, running was definitely good. I noticed that I needed to make sure my laces were rather tight as there was bit of a slippery feel with these socks. However, after tightening my laces, running was good, and comfortable. The wicking properties definitely came into play as the game went on, and after the game finished, the socks were still dry, and didn’t really stink. Whether they last a 1000 miles or not is yet to be seen. I’ll try but I cannot make any promises! As far as care instructions go, regular wool setting is fine for these, though I was a bit careless and threw them in my regular wash, and they came out absolutely fine. Available in white, it comes in three size options for UK, 6-8.5, 9-11.5 and 12-14. More information as well as buying options are available from the SockShop website. They retail for around €20.